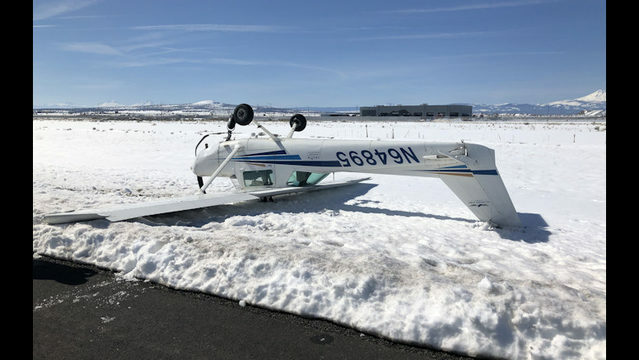 MADRAS, Oregon - A student pilot reportedly on his first solo flight apparently was doing well Friday afternoon -- until the end, when his "trainer" plane flipped upon landing at Madras Municipal Airport and came to rest on the snow beside the runway, officials said. Madras police and Jefferson County Fire District No. 1 crews were called to the airport on Northwest Berg Drive shortly before 1 p.m., fire Capt. Kasey Skaar said. Skaar said it appeared the pilot of the Cessna 152 single-engine plane was trying to land "and suffered some complications." The plane roll over its nose onto its top and came to rest in the snow about two-thirds of the way down the runway. Jefferson County Sheriff Jim Adkins said the student pilot on his first solo flight had no passengers and was landing on a runway cleared of snow when the trouble arose. The pilot was able to climb out of the overturned plane without injuries, Skaar said. With the help of the airport staff, any fuel or electrical hazards were mitigated. A salvage operation was expected to be completed later Friday. Skaar said Jefferson County EMS also assisted at the scene. The Federal Aviation Administration will determine the cause of the crash, Skaar added. An FAA representative was not immediately available for comment. FAA plane registration info indicated the plane is owned by Hillsboro Aero Academy.